My favorite pieces of jewelry are always personalized gems that celebrate my children. Katie’s Charms has a beautiful collection of beads and charms to create special bracelets and necklaces for every occasion. Jennifer, the talented designer and owner of Katie’s Charms uses only high quality beads and materials such as Swarovski crystals, Murano glass and sterling silver. I appreciate that her collection is so lovely and yet the pieces are affordable for everyone. The selection of beads and charms are fantastic and you can browse by theme, color, type or material to select the perfect ones. I am thrilled with my custom- made sterling silver bangle bracelet that features my children’s birthstones and is highlighted with additional sterling silver beads. It is so pretty in its simplicity and even my husband complimented my new bracelet (he rarely notices my jewelry). It fits really well on my wrist, has a wonderful shimmer that really makes it a stand out piece and every time I wear it, I smile and think of my beloved little ones. I was really impressed with my bracelet from Katie’s Charms and would definitely purchase additional charms for myself and to give as gifts for family and friends. I was also pleased to discover a NANA charm. I have wanted to create personalized jewelry for my mom but it has been impossible to find a “Nana” piece until I found one at Katie’s Charms. My mom will be so surprised to have a custom piece created just for her for the holidays and I can’t wait to see her expression when she sees her necklace from the kids. Katie’s Charms is the proud recipient of the 2011 StartupNation Leading Moms in Business Competition and it is easy to see why Jennifer is a winner with her beautiful jewelry, affordable prices and excellent customer service. You are invited to visit Katie’s Charms to view the entire collection and purchase your favorite charms and beads or select from her starter sets. She is always adding new charms/beads to her collection too so don’t forget to check out the latest arrivals. I like the HEART CROSS CHRIST charm. 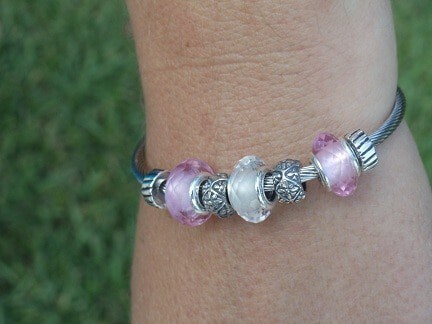 I like the Authentic Swarovski Aqua and White Crystals Bead Charm fits Pandora bead.